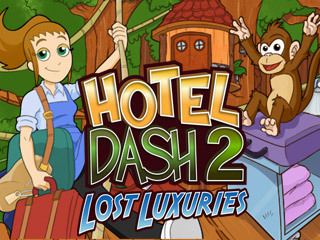 Manage the hotel hijinks and restore five of DinerTown's forgotten lodges in Hotel Dash® 2 - Lost Luxuries, a brand new housekeeping adventure for Flo and Quinn. This year, DinerTown is a strong candidate to host the International French Fry Festival after Mr. Big has invested heavily in making it a worthwhile destination. The only problem now however, is that he spent so much money on it that he doesn't have enough to build five new hotels, which are required by the contest rules. Flo has an ace up her sleeve though, and together with Quinn, they are going to make sure that they land the hosting rights to the festival. Help Flo and Quinn restore five nature-themed hotels built many years ago and turn them into retro-chic resorts. 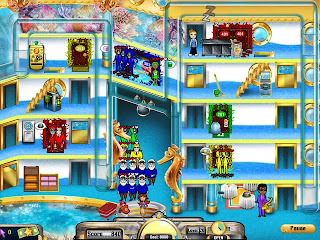 Glide down zip lines and more in 50 fantastic levels to prep rooms, cater to guests' requests, and clean up after them. Renovate each hotel with unique accents, buy splendid power-ups, and keep the guests happy. Will you restore enough hotels to host the festival, or will a sneaky competitor sabotage your efforts?